Infestation of Fleas and Lice! Infestation of Fleas and Lice - Please Help! I have had an infestation of fleas and lice. Now I have found a creature that almost looks like a piece of hay but it was woven into my shirt and biting me. Looks a little like a hook worm? Do they venture up one's back? I have 2 inside dogs and they are given baths and have Frontline applied to them but fleas were really bad this year and nothing has seemed to help. I have put the dogs into a separate space while I try to rid home of fleas. HELP! It's hard to say what you had in your shirt. It seems unlikely that it would be a hookworm. Are you having any reaction to the bite? Hookworms, if entering through the skin, generally go through the skin of the feet when people are walking barefoot. I haven't actually heard of hookworms crawling up your clothes, but that is not to say it is impossible. You didn't mention whether or not you still have the lice problem, but if you do, here are natural remedies for dealing with head lice. Regarding your flea infestation, here are some simple remedies that you may want to try. They have been quite effective for many people. Apple Cider Vinegar - Use a spray bottle to apply the apple cider vinegar to the coat of the dog. Also, add a little ACV to the dog's water bowl, about a teaspoon per quart. Apple Cider Vinegar seems to keep the fleas away and it also has other beneficial properties for the health of the dog. a glass of water each day. You may prefer to add a 1/2 teaspoon or so of honey to make it more palatable and to cut the acidity. The apple cider vinegar can be sprayed or wiped on your own skin, too, if you have a bad infestation and want some immediate relief from the biting and itching. You can also spray around your home with ACV, but of course, you will temporarily have the smell to deal with. Brewers Yeast - Brewers yeast can be sprinkled on the dog's food. My parents used to use this remedy years ago to keep our dogs flea free. Dawn Dish Soap - Bathing the dog in Dawn dish soap is another way to get rid of fleas on the dog. Start by applying a thorough coat of soap and lathering it up around the dog's neck and throat, just behind the ears. This will create a barrier so that the fleas on the rest of the body don't race to the dog's head and ears to escape death. Thoroughly soap and wash the rest of the body, rinse well (and dry well if it's cold weather). Dawn soap can also be used to help get rid of fleas in the house by placing a few drops of dish soap in a bowl of water and placing on the floor by a lamp or nightlight (low to the ground). The fleas will be attracted to the light and wind up in the soapy water where they will die. 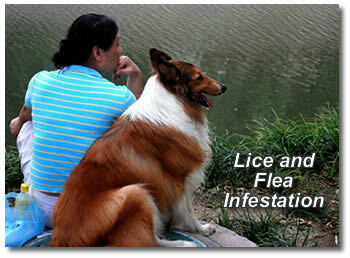 Let me know if you use one of these remedies for your infestation of fleas and have success or failure. I know other visitors who have the same problem will be glad to hear your results!